ROCHESTER, NY - MyLight, Semrock’s new online filter modeling tool, provides users with the ability to characterize optical filters under varying theoretical conditions in real time. Interested in seeing how a Semrock catalog filter behaves under a particular angle of incidence, polarization or cone half angle? MyLight can provide you with the theoretical answers by simply entering your parameters and selecting “Generate Plot.” MyLight data can also be saved, re-drawn and printed. Traditionally, optical filter data was presented at normal angles of incidence, average polarization assuming collimated incident light. But what if your system utilized a tilted filter and/or a cone of illumination? What if you were interested in the possibility of angle tuning a filter to optimize it to your specifications? In the past, you had to contact the manufacturer and wait for an answer. With MyLight, you can input your conditions, click, and immediately evaluate that filter’s theoretical data set. Designing and evaluating interference optical filters has never been easier. 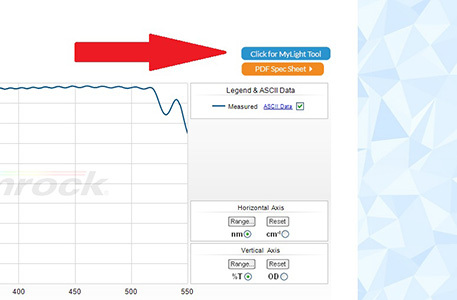 MyLight puts the power of optical filter modeling and evaluation at your fingertips.